How much are Notaires Fees for Buying a House in France? You’ve found your dream property, you’ve decided on a price and you’d like to make an offer – but what are the extra costs you’ll need to consider? Conveyancing, stamp duty – what else is involved, and how much might it end up costing? The overall fee you will have to pay is known as the Frais de Notaire, or Notaire‘s Fee, but this term is misleading, as the Notaire him/herself will only actually receive around ten percent of the total amount. It’s worth noting that in France the Notaire is a public official, and their fees are strictly controlled and regulated, varying according to the sale price of the property. The Notaire is only paid when all formalities are completed, and so they have no financial interest in letting a sale drag on. 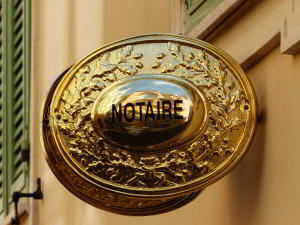 Once your sale has gone through, the Notaire is responsible for paying the stamp duty, or Droits de Mutations, and this makes up around 80% of the Notaire‘s fee. Of the remaining 20%, around half will cover expenses, such as documentation, the process of land registration and any associated travel costs. The final 10% makes up the actual remuneration of the Notaire for his/her services. Should you require specialist advice, or there are complicated clauses in your sale contract, there may be additional Notaire‘s fees on top of the basic charge, but the Notaire is legally obliged to advise you of these in advance – he/she is not allowed to bill you for any extra fees without prior notice. How much you pay depends upon whether you are buying an older or a new property, from a property professional, such as a developer, or from an individual. Stamp duty may vary depending upon the department in which you’re buying, but in most departments, at the time of writing, if you are buying an existing property more than five years old from an individual seller, the stamp duty will come to between 5-6% of your purchase price. Your Notaire should be able to give you an estimate of the fees and taxes, and will provide you with a final detailed statement on completion of the purchase. If you are buying a new-build, or off-plan (VEFA, which stands for Vente en l’Etat Futur d’Achèvement) directly from a property professional, the Notaire‘s fee is set at the lower rate of between 2-3%, of which stamp duty is calculated at 0.7% of the purchase price. You will have to pay TVA, or VAT, at the rate of 20% on the purchase price, however. In the case of buying land to build on, for sales between private individuals the usual stamp duty of between 5-6% is payable. If you are buying land from a property professional, just as with new-builds or off-plan properties, TVA is payable at the rate of 20%, but you will pay the reduced stamp duty of 0.7%, provided you commit to building your home within five years. If you are buying a fully furnished home, perhaps as a holiday home, it’s worth separating out the cost of the furniture from the actual property price with the seller, so that it does not contribute to the percentage calculated to pay both your stamp duty and the Notaire‘s fee. Please note that the figures quoted here were correct at the time of writing, but it’s always best to check with either your Notaire or a financial advisor.